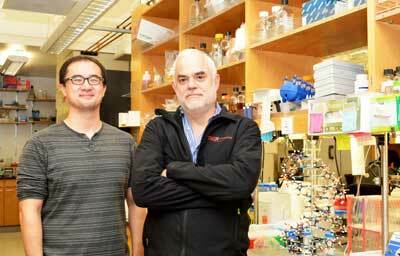 (Nanowerk News) Life's genetic code has only ever contained four natural bases. These bases pair up to form two "base pairs"--the rungs of the DNA ladder--and they have simply been rearranged to create bacteria and butterflies, penguins and people. Four bases make up all life as we know it. Until now. Scientists at The Scripps Research Institute (TSRI) have announced the development of the first stable semisynthetic organism. Building on their 2014 study in which they synthesized a DNA base pair, the researchers created a new bacterium that uses the four natural bases (called A, T, C and G), which every living organism possesses, but that also holds as a pair two synthetic bases called X and Y in its genetic code. TSRI Professor Floyd Romesberg and his colleagues have now shown that their single-celled organism can hold on indefinitely to the synthetic base pair as it divides. Their research was published January 23, 2017, online ahead of print in the journal Proceedings of the National Academy of Sciences ("A semisynthetic organism engineered for the stable expansion of the genetic alphabet"). Professor Floyd Romesberg (right) and Graduate Student Yorke Zhang. "We've made this semisynthetic organism more life-like," said Romesberg, senior author of the new study. While applications for this kind of organism are still far in the future, the researchers say the work could be used to create new functions for single-celled organisms that play important roles in drug discovery and much more. When Romesberg and his colleagues announced the development of X and Y in 2014, they also showed that modified E. coli bacteria could hold this synthetic base pair in their genetic code. What these E. coli couldn't do, however, was keep the base pair in their code indefinitely as they divided. The X and Y base pair was dropped over time, limiting the ways the organism could use the additional information possessed in their DNA. "Your genome isn't just stable for a day," said Romesberg. "Your genome has to be stable for the scale of your lifetime. If the semisynthetic organism is going to really be an organism, it has to be able to stably maintain that information." Romesberg compared this flawed organism to an infant. It had some learning to do before it was ready for real life. In stepped TSRI Graduate Student Yorke Zhang and Brian Lamb, an American Cancer Society postdoctoral fellow in the Romesberg lab at the time of the study. Together, they helped develop the means for the single-celled organism to retain the artificial base pair. First, Zhang and Lamb, co-first authors of the study, optimized a tool called a nucleotide transporter, which brings the materials necessary for the unnatural base pair to be copied across the cell membrane. "The transporter was used in the 2014 study, but it made the semisynthetic organism very sick," Zhang explained. The researchers discovered a modification to the transporter that alleviated this problem, making it much easier for the organism to grow and divide while holding on to X and Y. Next, the researchers optimized their previous version of Y. The new Y was a chemically different molecule that could be better recognized by the enzymes that synthesize DNA molecules during DNA replication. This made it easier for cells to copy the synthetic base pair. Finally, the researchers set up a "spell check" system for the organism using CRISPR-Cas9, an increasingly popular tool in human genome editing experiments. But instead of editing a genome, the researchers took advantage of CRISPR-Cas9's original role in bacteria. The genetic tools in CRISPR-Cas9 (a DNA segment and an enzyme) originated in bacteria as a kind of immune response. When a bacterium encounters a threat, like a virus, it takes fragments of the invader genome and pastes them into its own genome--a bit like posting a "wanted" poster on the off chance it sees the invader again. Later, it can use those pasted genes to direct an enzyme to attack if the invader returns. Knowing this, the researchers designed their organism to see a genetic sequence without X and Y as a foreign invader. A cell that dropped X and Y would be marked for destruction, leaving the scientists with an organism that could hold on to the new bases. It was like the organism was immune to unnatural base pair loss. "We were able to address the problem at a fundamental level," said Lamb, who now serves as a research scientist at Vertex Pharmaceuticals. Their semisynthetic organism was thus able to keep X and Y in its genome after dividing 60 times, leading the researchers to believe it can hold on to the base pair indefinitely. "We can now get the light of life to stay on," said Romesberg. "That suggests that all of life's processes can be subject to manipulation." Romesberg emphasized that this work is only in single cells and is not meant to be used in more complex organisms. He added that the actual applications for this semisynthetic organism are "zero" at this point. So far, scientists can only get the organism to store genetic information. Next, the researchers plan to study how their new genetic code can be transcribed into RNA, the molecule in cells needed to translate DNA into proteins. "This study lays the foundation for what we want to do going forward," said Zhang.